The Cay, by Theodore Taylor, is a good choice for teaching the story element of setting. Since the two islands where Phillip lives in The Cay are so different, students can practice looking closely at each setting, by focusing on details from the novel, to compare the two. Curacao, the island where Phillip lives with his parents at the beginning of the novel, is an island with a city and a busy working port. During the time of the story, it was the site of a World War II oil refinery. The island where Phillip and Timothy live after their shipwreck, on the other hand, is so small that it doesn’t even have a name or appear on maps. It is an island of deserted, sandy beaches and palm trees. There are no houses, no roads, and no inhabitants. 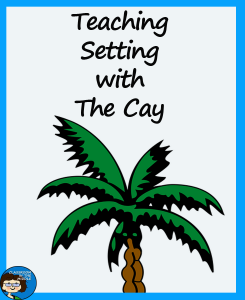 Throughout the story, the author of The Cay provides more details about the island itself, its climate, and the plant and animal life there. One way to practice identifying settings with this story is to have students draw the two islands. Before they draw, tell the students make a chart listing details of each island. Categories on the chart might include: size of the island, population, cities, industries, transportation, location, vegetation, food sources, and communication. Students can then use ideas from their chart to make their drawings of the two islands more detailed. One follow-up activity might be to have students complete a Venn Diagram, or participate in a discussion, to compare Phillip’s life on the two islands. 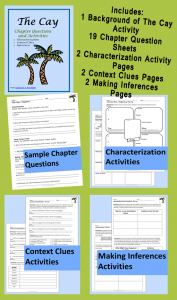 Students can also discuss how the two settings contribute to the plot and conflict of the story. 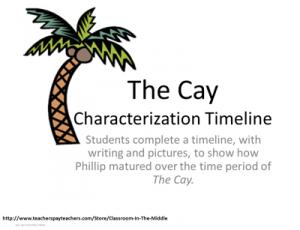 For a free printable activity with The Cay see , The Cay – Characterization Timeline. 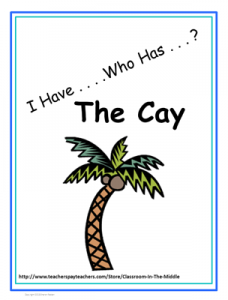 To see more resources for teaching The Cay, click on the images below to check out the novel study and an I Have . . .Who Has . . ? game in my Teachers pay Teachers store.